Above is a photo for my food and phoneography category, since the snapshot was taken with a phone. A few days ago when the weather was good, my mother invited me and we sat on her balcony. 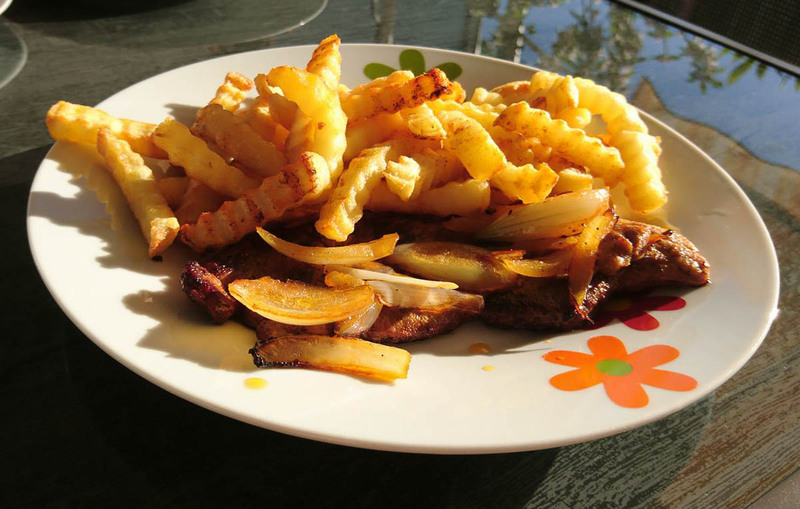 We planned to eat something together but we weren’t creative and decided to eat something simple, french fries with steak and onions and different sauces we wanted to try. It was simple but very tasty. You can’t go wrong with steak and chips. I generally think of French Fries as being the very narrow fries like you get at McDonalds and I call the thicker ones chips but I think the two names are probably interchangeable. I often face the problem to choose either the British or American translation, if there is a word with both. I often chose what I find better or what I don’t confuse with things we have in Germany. For example the word chips is used in Germany for those bags filled with roasted potato chips. Australians call those potato chips too and seem to have no problem distinguishing between the two. I still think of them by the British name of crisps. I think our language in Australia is a hybrid of British and American words.